[3-in-1 Functions] Tests moisture, PH value and light level by using two 20cm probes and a light sensor. - PH is a measure of the acidity or alkalinity of the soil which some plants are sensitive to. - Sunlight determines if a location is best suited for a shade or full-sun plant. - Soil moisture lets you tell how well the soil is absorbing and holding moisture. 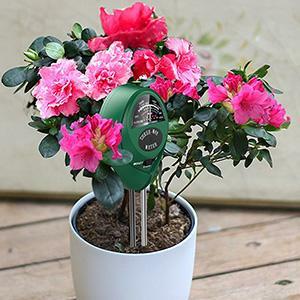 With a 3-in-1 Soil Meter, you can easily check on the condition of your plants. The moisture meter will quickly tell whether your plants is doing well. Firstly, let you know that dry and needs water or wet and could use a day to dry out, you will never over/under water your plants again. Secondly, it helps you to control PH level in soil, acidic or alkaline is suitable for your plants. Thirdly, testing whether plants getting adequate sunlight. Above all, equipped with this meter, you can give best care to your plants and keep the soil and lawn healthy and happy. -Don't measure liquids especially water , it is only used to test the soil moisture or PH. -Choose a soft soil, forbid to force the metal probe into the hard soil. Please don't put the probe pen for a long time in the soil (no more than one hour), otherwise it will damage the pen.